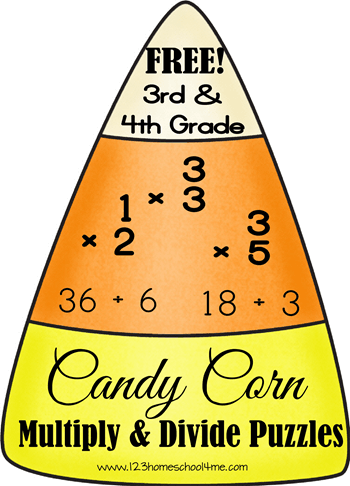 Check out these FREE Candy Corn Multiplication & Division Puzzles! This is a super fun math games that will help kids get excited about and enjoy math. Kids will hardly realize they are practicing math when it is this fun! This candy corn math puzzles is geared at 3rd grade and 4th grade students who are practicing multiplying and dividing with numbers from 0-18. Simply print on card stock (for durability) and cut out the candy corn, then cut apart the colored sections. Have your student put together the puzzle by solving the division and multiplication problems. There are 22 puzzles to complete.